Stained-glass artist Jean Mauret has passed a difficult step in his art, ridding himself of ancestral shapes & technical constraints. This rupture and new-found freedom is in line with his approach. The ‘Grange aux Verrières’ has enabled Jean to delve back with glee into boxes of old stained-glass off-cuts, just as he used to do in his grand-father’s workshop as a child. The stained-glass he created two or three years ago were already made up of long narrow multicoloured strips that seemed to grow like tulip stems all the way to the top of the window. Today, these "vertical strips" go beyond the window, freeing themselves of heavy technical constraints along the way, and leaving space to emotion and structure in the space they occupy. 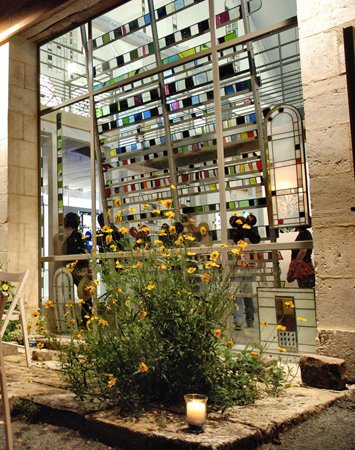 At the Stained Glass Barn, visitors also get a glimpse of work produced by Jean Mauret’s peers such as his stained-glass artist grand-father, Henri Guérin in 2010 and Jean-Dominique Fleury exhibiting his art at La Grange this year. Please do not hesitate to contact me me if you encounter any problems with the site!